If you want to learn how to make an Easter pie, this could mean a variety of different kinds of pies depending on which country you are speaking or which meal. There are good recipes for pies to go right along side of the French toast, hot cross buns and other buffet or dinner foods. You will find this also true in many other countries. Personally I have served a variety of cheese and egg pies on my Easter buffet. When I began learning how to make an Easter pie, then my first thought went to luscious creamy rich dessert pies. This is especially true for holidays like Easter. My traditional pies for this holiday are the chocolate, coconut, butterscotch, lemon and banana cream meringue pies; I usually bake one of each. 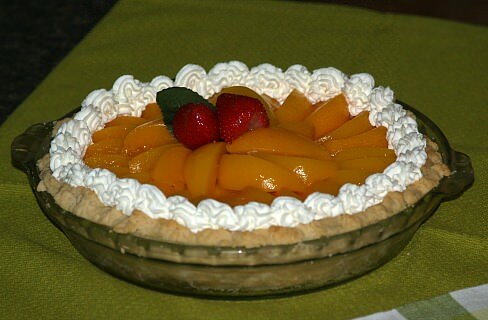 If I am having a large crowd, I will add some specialty pies; rich and creamy and maybe some fruit added. Cooks of many countries have learned how to make an Easter pie with their own traditional recipe. From the region of Naples, Italy we have the pastiera pie recipe. This delicious dessert is made with a slightly sweet pastry crust and filled with a creamy ricotta cheese and fruit filling. Although Spain is known for many wonderful creamy custard desserts, their most famous pie is the Salamanca Easter pie; an oven baked meat stuffed pie. Whatever the occasion there are many great recipes with delicious flavors from around the world for you to choose from; it could be a dessert pie or a creamy cheese, meat and egg filled pie. Combine the cheese, sugar and vanilla; mix until well blended.Spoon into bottom of crust; Chill until firm. 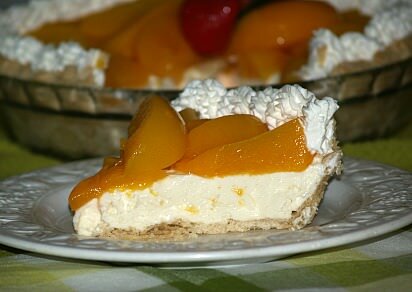 Before serving, arrange peach slices on top; garnish with whipped cream and strawberries. Although the name “French silk pie” sounds like it must have originated in France, there seems to be a lot of contradictions to that fact. At the most, stories relate this dessert to a Frenchman here in the United States who created it. It also could be that the creamy delicious ingredients in this recipe makes one think of the French cuisine. Whatever the true story is, this is a wonderful dessert pie suitable for any occasion, even serving as one of your favorite Easter pie recipes. Mix brown sugar, flour and pecans. Melt the ¾ cup of butter in a 9x13 inch baking pan. Add the dry ingredients to melted butter and stir to blend. Bake in the oven for 20 minutes, stirring with a fork every 5 minutes until mixture is dry and crumbly. Cool and add filling. For the filling, in a mixing bowl, cream the 1 cup of soft butter and sugar together. Add vanilla and melted chocolate. Add the eggs and beat. Pour over the crumb mixture and chill. Add topping. In a mixing bowl whip the cream with the coffee and powdered sugar. Top pie with the whipped topping and arrange top with sliced almonds. Refrigerate until ready to serve. This plum pie recipe is an upside down pie recipe and makes a beautiful and delicious dessert; add it to your Easter pie recipes. Cut 15 inch circle from heavy duty aluminum foil; line 9 inch pie pan leaving 2 inches overhanging. Spread butter over foil; place pecan halves rounded sides down on foil. Mix brown sugar and corn syrup; drop by small spoonfuls over the pecan halves on buttered foil. Prepare pie crust mix according to package; roll one pastry into 11 inch circle. Ease pastry into pie plate over top of pecans and brown sugar mixture. Mix remaining ingredients; pour into pastry lined pie pan. Roll another pastry into a 12 inch circle; fold in fourths and cut slits so steam can escape. Place pastry over filling and unfold; seal and flute edges. Turn up overhanging foil so it catches bubbling juices and prevent crust from excessive browning. Bake 10 minutes; REDUCE HEAT TO 375 F degrees. Bake 35 to 40 minutes longer or until crust is brown and juice begins to bubble through slits; cool 5 minutes. Turn foil away from pastry; invert pie on heatproof serving plate and peel off foil. Place cream cheese and sugar in food processor; process until smooth. Add flour, 2 teaspoons vanilla, eggs and ½ cup cream through feed tube while processor is running; process until smooth. Add 2 cups blueberries; pulse quickly on and off twice; pour into unbaked pie shell. Bake for 45 minutes; turn oven off leaving pie in oven for 1 hour with door ajar. Cool to room temperature and then refrigerate overnight. Mix topping; beat 2 cups whipping cream in a large bowl on high speed until stiff peaks form. Beat in 2 tablespoons powdered sugar and 1 teaspoon vanilla; spread over top of pie and garnish with 1 cup blueberries.